I have been a fan of Kenny Price for many years. Like most of you, I got my introduction to him through Hee Haw, where he was a featured player for well over a decade. In the mid-80s I was plum crazy about his travelogue program on the Nashville Network called Wish You Were Here, where he and his wife Donna drove across the United States in their RV and showed us all the places you can go. I was clearly not the target audience in that instance, and that was of little matter to me. Price was just fun to watch — a big, old-fashioned, charming, happy man with a natural comedic style. Price could flat-out deliver the goods, no matter what the tempo. In my estimation, he was at his best when doing bouncy, upbeat songs. The first recording I ever heard of his was “Let’s Truck Together,” a classic trucker anthem that I feel is his signature tune. But when tackling love songs or spirituals, he was still very much in his element. Price recorded for Boone Records (working with the very capable Ray Pennington), then later RCA where he was perfectly complimented by the legendary “Nashville Sound.” (He again worked with Pennington, who always seemed to bring out his best, a few times during his RCA run.) His vocals were strong with plenty of character, and he did a lot of styles, which meant various production styles could be implemented. 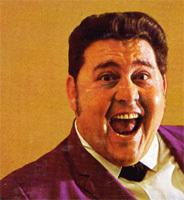 Nicknamed “The Round Mound of Sound,” the 300-pound Price parlayed his size into a few fun gimmick songs that were self-deprecating to a certain degree, but also filled with a sense of contentment that I have always found refreshing. One of the best is “The Heavyweight” (from the album of the same name) where he tells the ladies “… You won’t get cold in the winter, and I’m shade in the summertime.” Price, just like contemporary Cass Elliott, acknowledged his mass and refused to let it be a disadvantage, turning it into a strength and part of his identity. And, like Elliott, most of his material is cheerful and optimistic. His music may be (sadly) long out-of-print, but it is still as effective as ever. If you get the hankering to listen to some really solid country, hunt down some of his LPs and get ready to smile. Kenny Price will not let you down. Oh, boy, there’s a lot of beautiful 1960s country going on here. Released on the Boone label and produced by Ray Pennington, all of of these tunes were scattered around and re-packaged later on when Price went to RCA (under the LPs Walking on New Grass and Happy Tracks). Kenny plays the whole range, from the aching sadness of “I’m a Long Way From Home” to the overt joy of “Downtown Knoxville.” This also featured his self-penned signature tune, “Round Mound of Sound.” He walked the line between the Countrypolitan stylings of the 50s and 60s and traditional country at this point — a neat blend. Just great, great stuff that should not be missed. Country music had changed a great deal by the dawn of the 1970s, and Price adapted nicely to the new surroundings. Now with a more modern edge, Price could stick to what he loved and not sound dated. The title track is classic Kenny Price: funny, bouyant, alive with spirit. The album is a fine sampler of his ability to convey different emotions, and tell stories with wit and resonance. These songs had been covered ad nauseam at this point, and it might look like another tired old filler album on the surface. But the old hand breathes new life into these standards. I won’t go as far as calling this his very best record, but I like to list it as an example of the true talent of Kenny Price. To make something familiar sound fresh and exciting again is no small task. As far as I’m concerned, Price’s lusty delivery on “Sea of Heartbreak” is enough to sell the whole package. I love this feature you have on your blog. I really do think you should consider honing in your writing skills and go into op-ed journalism. Thanks, Loren! I appreciate the comment. I figure if you say what you feel with passion, you can’t really go wrong. And I love Kenny Price to pieces — breaks my heart that he isn’t better-known. But in my own way, I will try to promote him. Love your blog! We loved Kenny Price singing with the quartet on Hee Haw and loved his RV’ing show, “Wish You Were Here”. That’s what led me to your blog. I was trying to do a search to see if there was somewhere online to watch those old episodes. Too bad they can’t be found, because they were so much fun! I loved to watch him cooking for fellow campers, etc. Thanks again for the blog! Hey Liz. Thank you so much for writing! I have been looking for those episodes for years, myself. Those were certainly the great days of the Nashville Network! But with all the changes at TNN, I think those old master tapes are long buried, and will more likely than not never resurface. All we can do is hope another fan out there has copies. I have an old promo photo from the show signed by both Kenny & Donna. I should post that up here. Good times! Hi again! I’m sorry I missed that you had written me back. I’m afraid you might be right about the episodes being lost. It’s a shame. I am going to continue looking, now and then, for them. I’m keeping your message board favorited and if I ever find them online, I’ll be sure to let you know. KP had a beautiful voice..the very best of the Hee Haw Gospel Quartet, for sure! I just popped back in to say, I’d love to see that autographed photo, so please do post it! I just popped back in to say, I’d love to see that autographed photo, so please do post it! Thanks!